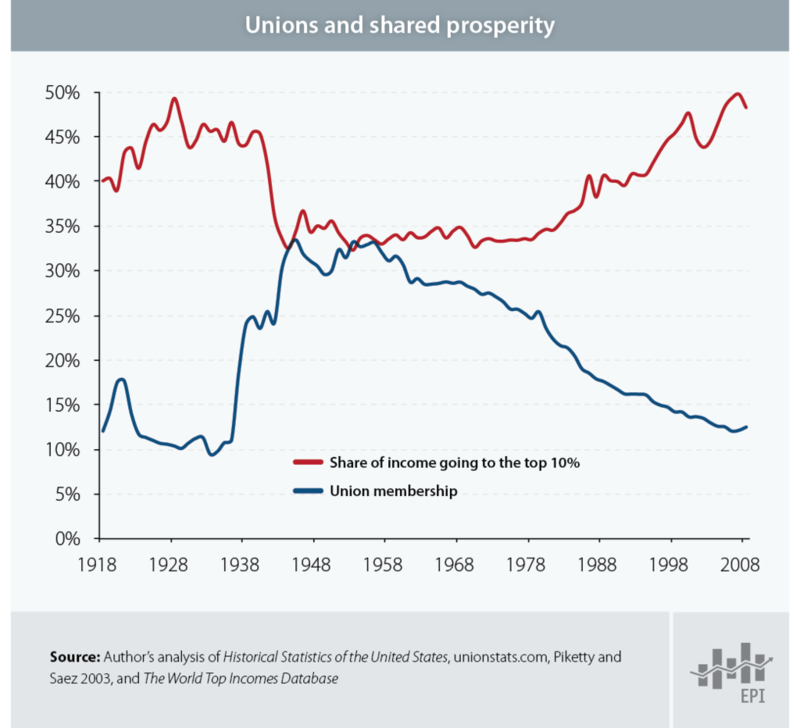 As I've written about before, I believe that one of the sources of increasing inequality in America today is due to the weakening of the labor movement over the last generation. If we want to redress the issues plaguing us in America today the labor movement needs to be revitalized and remobilized. With that in mind, let me alert you to the national strike going on today in the fast food industry. You can follow the "Fight for 15" developments today at Strike Fast Food. Pre-strike coverage can be read here at the New York Times, USA Today, and Time. Starbucks has already cut hours for most employees to cover its losses in paying Washington state employees $15 an hour. McDonalds, etc., will likely follow suit if forced to raise wages. So what good does it do to make $15 an hour, but for fewer hours? I don't see this ending well. I don't think this is a battle that ever ends. Labor is always going to have to struggle and assert itself. Generation after generation. Not as long as para-professionals, custodians, lunchroom workers, and secretaries in public schools are making what they make!! Or they go up on prices and people stop eating fast-food. The dollar menu has kept Micky D's going. Are you familiar with Thomas Piketty's book Capital in the Twenty-First Century? He argues that the major shocks of the first half of the 20th century (two world wars and a great depression) were what led to the increased income equality in the post-1945 period. I wouldn't say that labor organization made no difference - there are obvious ways that it did - but I wonder if the economic shocks that Piketty talks about created a climate in which organized labor could assert itself. In that case, is our current situation closer to the "ordinary" way of things? The problem that another comment made about workers losing hours is a real one - I think it will be the inevitable response to higher wages unless American labor organizes itself again. I don't know if it will happen, but maybe, just maybe it could. I don't follow - are we supposed to keep anyone from improving their wages until everyone does? In the UK, the so-called (New) Labour Party itself, since Blair, has reneged on its origins and its commitment to ordinary working people by distancing itself from the trade unions. With its "we're as tough as the Tories" populist MO BS, it has made the same ideological shift to the right on immigration. Instead of taking an egalitarian and communitarian lead, it has opted instead for a sell-out to capital and a manipulative appeal to envy and fear. The next election looks to be between the unconscionable (Labour), the reprehensible (Tories), the pusillanimous (Lib Dems), and the downright wicked (UKIP). Only the Greens have any moral backbone and vision - and (generous odds) a chance of slim to none. O temora! O mores! Good riddance to the whole lot of 'em if they can't understand what happens when the labor expense floor is arbitrarily raised without regard to value returned. Given that it's only the city of Seattle that raised the minimum wage to $15 (Washington state's minimum wage is $9 and change), and given the fact that Starbucks is a huge corporation with coffee shops all over the world, if they have cut hours for most of their employees world wide, I have difficulty believing that is a result of Seattle raising their minimum wage. would not be able to afford it,” Schultz said. Sam Francisco's got a $15 minimum wage increase on the ballot in November, and Los Angeles' mayor is pushing hard for a $13.25 minimum, so there will be ample opportunity for the rest of the country to see what happens. I work in a unionized environment in Canada and in my industry at least it is interesting to see the current government using economic recovery rational for settling labor disputes by arbitration. I think the balance of power is probably a good thing, but both sides need checks and balances to stay healthy. The public service unions in particular seem to operate in a strange zone because government has to balance popular sentiment and the massive voting share of its employees when bargaining collective agreements. We could through the church though attempt income stabilization by using offering and tithes etc to subsidize the lesser paid in our communities. I suppose it just depends on the value we place on worship and teaching versus income equality. I guess that also raises questions about how much people should suffer the consequences of their choices or their parents choices though. All I know is that my current job is more enjoyable, pays more, and I actually have to do less then many of my prior jobs which while certainly nice, doesn't seem fair to those who were born into less opportunity and education. They aren't all bad you know. Just like people some just want power for it's own sake, some want to serve the people, and others just like being in charge of something. While maybe the super union has become a bloated ineffective servant of the people I still think that there is value in ability of individuals to stand together against injustice. Just in time for the Predictable Ironies Olympics, a machine stands ready to take over for the burger specialists who refuse, against all rationality, to flip burgers for less than $15/hr. Even more, *ahem*, delicious is this: design team prominently featured Berkeley grads. You and I both! That is, assuming there's an equally reliable way of measuring a CEO's marginal value. But fundamentally, I certainly agree, whether you expected that or not. I just think if we are going to err on either side, it should be on the side of people who have no voice and will suffer more as a result of poor economic planning. I don't think there is always a right policy for all seasons, but I do tend to lean more to the idea that stronger lower and middle class will mean more consumer spending and in the long run will mean a more stable financial future for local companies who can then earn a living from that demographic rather then viewing them as an expendable commodity in the production process. I agree that the answer is rarely so simple, and maybe the strength of labor movements at those times were tied to economic ability rather then vice versa. If you factor in union money and mob money from those that co-opted the labor movement then perhaps what the graph shows is the lobbying power of a stronger middle class asserting itself in union membership as a way to have a voice in American politics that they had never had. My granddaughter works in a PHX-area Starbucks and that's what she was told. Key words "in the business world." The opposite of supply and demand in the business world is not justice and mercy but coercion, control, and force. There is nothing at all Christain about forcing someone who owns a means of production to pay anyone $15/hr, or $4.25 for that matter, which was my first wage, in an ancient time so long ago and far away. To be clear, I also detest the bankster Wall Street class robbing this nation blind using it's current corporate-fascist social democracy political structure to do so. The only political (apolitical really) and economic philosophy I have found to square with my Christain faith is anarcho-capitalism, or Voluntaryism. There is no place for force or coercion against another human being or his property. Am I generous to and cognizant of the plight of those around me? Yes. Do I want others to be? Yes. But that is their choice alone. As my daughter and I passed another empty building down town one day, I remarked that this is the result of "trying to live like Warren Buffet at Wal Mart Prices". We have chased the dream of luxury on the cheap so long that our demand for profit at the lowest price has driven jobs that pay off shore, fostered automation of jobs, cut wages, benefits and hours. Forget the 1% cry, the 1% have been with us forever, and will continue to be. What is happening between poor government policies (from local, state and federal), poor business practices (both labor and management), and add into the mix our buying sprees on credit, our refusal to refuse to purchase goods at exorbitant prices (i.e. cell phones) we have basically done to ourselves. McDonalds, BK, Wendy's used to be the teen age beginning jobs, low skilled jobs that we started out doing to get that job experience, to earn money between semesters. It was not a full time job. So, when did it become one? Well, just look at our recent labor history. The unskilled jobs in manufacturing are going or gone, even if they did exist where you live, we can no longer "return to the farm" like our grandparents did during the depression. IT just goes on and on. Let's help spread the wealth. 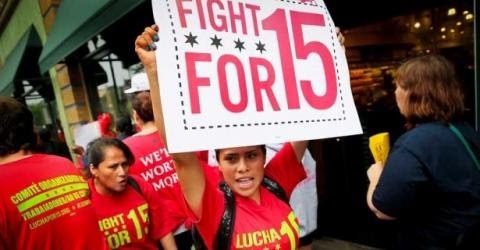 Help fast food workers fight for $15/hr! Taylor Swift and Fast Food! - Fight for $15!